AFTCO'S "Gold Series" Bait Nets, with their woven polyester netting - a commercial grade, knotless, bait-friendly mesh, designed to last for many seasons of heavy use - are the perfect live bait net choice for scooping delicate baits like anchovies, menhaden and sardines. The D-shaped stainless steel net hoops, available in 8 and 10-inch widths, allow for easy capture of the liveliest baits because they'll reach into the corners of the live bait well. The bait net attaches to the net hoops with a special PVC coil that not only eliminates abrasion to the netting, but minimizes damage to baits during the scooping process, as well as protects the inside of the bait well or tank from being scratched or chipped by the stainless hoop. 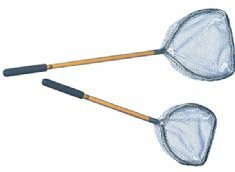 AFTCO Bait Nets feature Gold anodized aluminum handles with black vinyl grips, and are available in lengths of 12, 18 and 24 inches.